Phuong Quan Production & Trading Co.,Ltd.’s factory is located at Long Dinh Industrial Zone in Long An province with 22.000 metre square. It has been fitted up with a modern production line include: 06 of flat yarn extrusion machines, 200 of circular weaving machines, 100 of sewing machines, 02 laminate machines , 15 of offset printing machines, 10 of HD and PE liner machines, 05 of automatic cutting and sewing machines, 01 of turn-over machine, etc. Thus, the factory’s capacity is 100 Million bags per year. So that, Phuong Quan can satisfy customers with high specification and large order. Our products are packing made by up-to-standard polypropylene to contain sugar, rice, wheat, cattle’s feeding, fertilizer, chemical, agricultural product, etc. In addition, all of our products must be passed the quality checking progress stringently to ensure that products reach the customer’s specifications (extruded yarn denier, withstand, heat and moisture, sunshine). With our experience in production, trading, import-export polypropylene woven packing product, Phuong Quan Production & Trading Co.,Ltd. is commit to supply products with best quality, specification reaching, competitive price, sensible payment, on time delivery. We hope to receive potential orders from you. 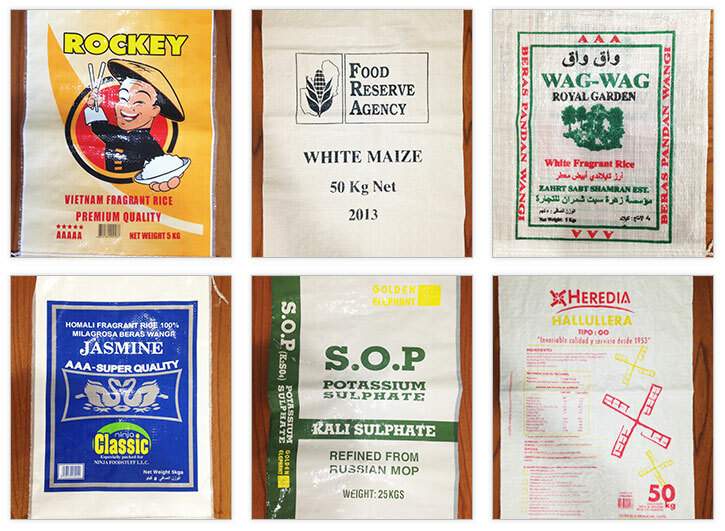 Polypropylene woven bag production process is expected that the raw material to be mixed by PP pips and other additives. Then the raw material to be sqeezed by melting system as film. Film is cut to get flat yarn in different size. 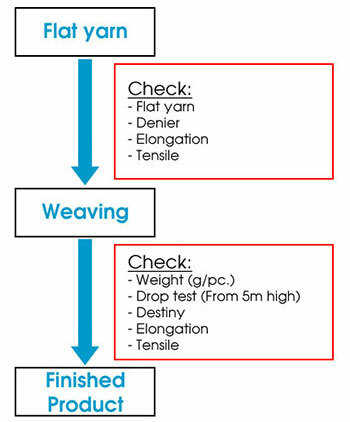 The yarn will be woven by vertical and horizontal yarn weaving. 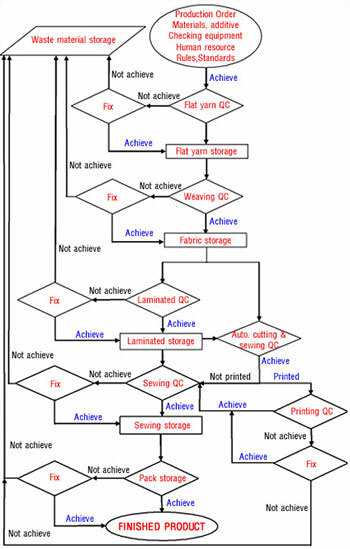 With a flexible process, we can produce as any of customer’s requirement. Phuong Quan Production & Trading Co., Ltd. can be produce flat yarn with minimum 1.6mm width, as following specification:* Elongation: 16% to 23 %. * Inte: 4gf to 5.7 gf/1 denier. 80A - 82 Vành Đai Trong ,P Bình Trị Đông ,Q. Bình Tân, TP.HCM Việt Nam . Copyright © 2012 Phuong Quan Co., Ltd. All Rights Reserved.